Protestors cross the Roberto Clemente bridge during a evening rush hour march that began in downtown Pittsburgh, June 22. They are protesting the killing of Antwon Rose Jr. who was fatally shot by a police officer seconds after he fled a traffic stop June 19, in the suburb of East Pittsburgh. The city of Pittsburgh is on edge and boiling hot after an East Pittsburgh Police officer with a checkered past shot and killed an unarmed high school student after police stopped the vehicle the young man was in as a part of an investigation into an earlier shooting. Allegheny County Police Superintendent Coleman McDonough said officers found two firearms on the floor of the car. He added that they found no weapons on the slain Black teenager. 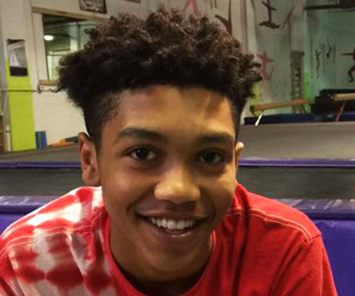 A bystander’s video of the June 19 shooting shows Antwon Rose, Jr. and an unnamed companion jumping out of the car and running away, and Antwon collapsing after being shot three times in the back by an officer identified as Michael H. Rosfeld, 30. The funeral for the young man was held June 25 and some 200 people came out to show their respects and activists did not protest out of respect for the family’s mourning. His mother told ABC News, in an interview, that the police officer murdered her son. Every day or night since the killing of the Woodland Hills High School honor student, angry, determined residents and groups including the Alliance for Police Accountability, NAACP and ACLU of Pennsylvania—seeking #JusticeforAntwon—have either locked down sections of Interstate 376, the main thoroughfare of downtown Pittsburgh, blocked the Rachel Carson Bridge, protested at a Pittsburgh Pirates game, rallied at least twice at the East Pittsburgh Police Department and trooped to the Alleghany County Courthouse which houses the offices of Pittsburgh and Allegheny County District Attorney Stephen A. Zappala, Jr.
And, a Pittsburgh activist said, students at several schools June 21 staged walkouts in silent protest of what many in the city are calling the unjustified killing of a humble, affable and well-liked teenager. Civil rights attorney S. Lee Merritt, who was hired by Antwon’s family to represent them, said he’s hoping that public pressure will force Mr. Zappala to charge Officer Rosfeld but he’s doubtful. Mr. Merritt has been involved in a case in Texas where police officer Roy Oliver fired a rifle into a car with four Black teenagers driving away from him, killing 15-year-old Jordan Edwards. He said members of the community and legal and civil rights organizations applied significant political and economic pressure which led to Officer Oliver being fired and charged with murder. His trial is set to start this summer. 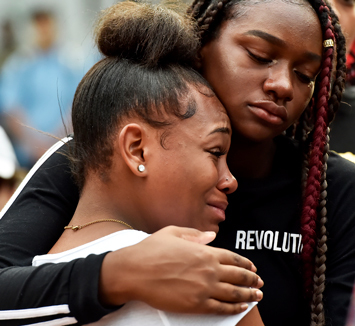 Tia Taylor, left, is comforted by her friend Jameira Mosely during a protest of the shooting death of Antwon Rose Jr. in Market Square, June 22, in Pittsburgh. Both attended school with Rose. Protesters demonstrated June 22 for a third day over the fatal police shooting in Pennsylvania of the unarmed Black teen fleeing a traffic stop as they sought to get the attention of a nation engrossed by the immigration debate, and to pressure officials to charge the officer. The pressure is mounting on District Attorney Zappala with the protests and an announcement by the medical examiner, who ruled Antwon’s death a homicide. Under Pennsylvania law police officers are allowed to use deadly force to prevent someone from escaping arrest if he or she has committed a forcible felony, is in possession of a deadly weapon or if that person has indicated he or she will endanger human life or inflict bodily injury if not arrested. But there’s nothing that he’s learned so far that justifies an unarmed young man running away from the police and posing no danger to them, to be shot and killed, Mr. Merritt said. In the days following the fatal shooting, “police sources” have sought to besmirch the name of the young man, leaking to local media that they have video of Antwon firing a gun and that forensic evidence shows gunshot residue on his hands. High school Principal Candee Nagy told a TribLive reporter that Antwon competed in academic competitions throughout high school. District officials said he scored high on his SAT test and was one English class shy of graduating. Mr. Merritt said Antwon’s mother, Michelle Kenney, planned to have an open-casket funeral, reminiscent of Mamie Till, whose son Emmett was abducted and murdered in Mississippi in 1955 by White men who beat him and tossed his body into a nearby river for allegedly whistling at a White woman. 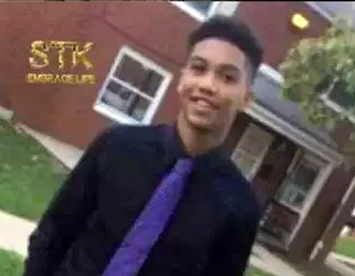 Antwon Rose, 17-year-old boy who was fatally shot by police in East Pittsburgh, Pennsylvania. A rogue cop allowed to run free? Shaun King, an investigative reporter for The Intercept and co-founder and lead organizer for the Justice PAC—which seeks to elect reform-minded district attorneys across the country—has been breaking news for the past several days about Officer Rosfeld. On June 23, he posted a note on social media saying that a high-ranking official from the University of Pittsburgh confirmed that Off. Rosfeld was fired from the university in January after brutally assaulting a Black student and lying about it. East Pittsburgh Mayor Louis J. Payne told a reporter with the Tribune-Review that Off. Rosfeld had been sworn into the department a few hours before the shooting. Off. Rosfeld said in an interview two days after the shooting that he’s been a police officer since 2011, and worked with other area departments for eight years, including the University of Pittsburgh, Oakmont and Harmar Township. Off. Rosfeld is now on unpaid leave. Mr. Merritt elaborated on the officer’s alleged past behavior. Pittsburgh resident Bomani Howze said the Steel City is a tinderbox. “It’s 360 degrees here, really hot,” said Mr. Howze, an investor and activist. “It’s hot for multiple reasons. As spring heats up, old beefs start to cook up. (Up and coming Rapper) Jimmy Wopo was killed in Hill District this week. He was about to be signed by Wiz Khalifa. All of this is happening right now. Protesters chant "Hands up! Don't shoot!" at motorcycle officers near the head of a line of vehicles stuck on Interstate 376 in Pittsburgh on June 21. 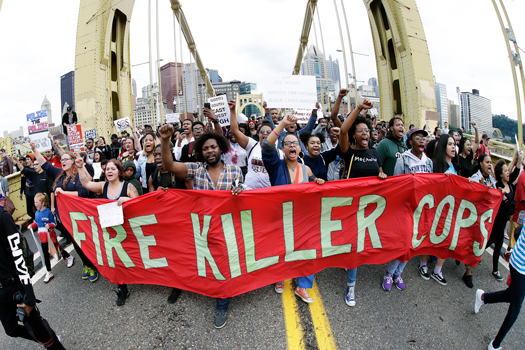 The highway was shut down by the people protesting the East Pittsburgh police after the June 19 shooting death of Antwon Rose, a 17-year-old boy fatally shot by a police officer in Pennsylvania seconds after he fled a traffic stop. He did not pose a threat to anyone, a lawyer for the family of the teen said. Mr. Howze said elected officials are pressing law enforcement hard to keep a lid on the violence because they’re trying to persuade Amazon to bring its headquarters to the city. Politicians like the mayor are “responding with their interests,” the district attorney is standing for re-election and the public is very aware of the political calculus, he added. Jasiri X, a Pittsburgh-born rapper and activist, said Black people in Pittsburgh are tired of being taken for granted. “I had an interview this morning (June 22) and I was asked how we can cool down the anger of the people—you should be upset, you should be outraged,” he said. Pittsburgh-born, Washington, D.C. resident Jamila Bey left Pittsburgh in 2000 because she had determined that the city was no place for a Black person to live or to raise a child. Ms. Bey said she happened to be in Pittsburgh to visit her mother who had unexpectedly fallen ill and was in the hospital. “I stopped in front of the courthouse and I estimate that there were about 1,500 people out there,” she told The Final Call in a June 20 interview. “We have ‘hunting and fishing cops’ who are back from Iraq and see Black people as the enemy. They live outside of the city and have no interest in the city or the people they serve. This is the pattern here in Pittsburgh. The city’s struggles to get a handle on this problem bear Ms. Bey out. Pittsburgh is said to be the first big city police department to agree to a consent decree with the U.S. Department of Justice in the 1990s after federal investigators discovered a pattern and practice of police misconduct. The result was more resources, improved training and broader oversight of the myriad activities and operations among the ranks of the police. But Black Pittsburgh residents say police officers never stopped harassing, brutalizing, profiling and killing them with little oversight or accountability. The issue of the police-involved killings of primarily unarmed Black men, women and children continues to roil the United States. Trayvon Martin, Michael Brown, Korryn Gaines, Tamir Rice, Oscar Grant, Sandra Bland, Stephon Clark, Rekia Boyd, Eric Garner and Natasha McKenna are just a few of the hundreds of Blacks who have died at the hands of the police or someone acting in that capacity. In almost every case, the individuals who pulled the trigger were not charged and served no time for the murders. According to the Mapping Violence project, police in the U.S. killed 466 people in 2018. Law enforcement killed 1,147 people in 2017 with Blacks comprising 25 percent of those slain despite being only 13 percent of the population. Fox News notes that since the start of 2018, at least 45 law enforcement officers across the U.S. have died while on duty—with 27 of the deaths caused by gunfire. Various studies show that Blacks are nearly three times more likely than White Americans to be killed by police and are five times more likely than Whites to be killed while unarmed. The cycle of shootings, outrage and district or states attorneys or grand juries opting not to press charges has fueled strident protests nationwide and equally vocal demands for change. In this case, several civil rights organizations are demanding that the attorney general of Pennsylvania handle the investigation into Antwon’s death. A recent study illustrates that the wider Black community is affected by these killings. Researchers published a study in the Lancet Medical Journal which indicates that police violence has a direct effect on the mental health of Black adults. Celebrity hair stylist Fela Sekou was equally caustic when sharing his view of police-Black community relations. He recalled as a 19-year-old how Pittsburgh police officers stopped him and two friends downtown because a White man had been robbed. 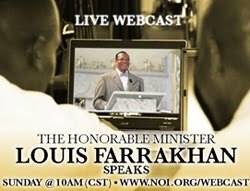 The Honorable Minister Louis Farrakhan speaks at Mosque Maryam in Chicago, IL May 27, 2018. Those who vehemently oppose the Honorable Minister Louis Farrakhan recognize the global impact he has and is having on the masses via an array of social media platforms and they won’t stop until his accounts are completely shut down. “Zbigniew Brzezinski, who was a national security adviser, I think under Jimmy Carter, he said, ‘It’s easier to kill a million people than to control a million people.’ With the technology that’s now available: You and I are talking, and the words that we just spoke are on social media,” said Minister Farrakhan during a recent radio interview in St. Kitts. Evidently, the Satanic Jews and Synagogue of Satan hate the sight of his words, videos and images trending and spreading on Twitter, Facebook, Instagram or YouTube and generating millions of views. They hate to see daily comments and testimonies from those who are instantly touched by him on every continent. So, it’s no surprise that specifically the past eight months the online campaign to ban Minister Farrakhan has intensified. 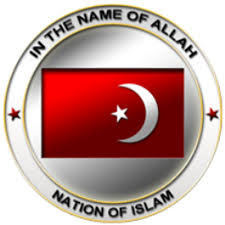 However, they have been countered by online users inside and outside the Nation of Islam who support Minister Farrakhan and have appreciated his presence on social media the past seven years. On June 8, Twitter, Inc. de-verified Minister Farrakhan’s Twitter account (@LouisFarrakhan) by removing his blue verification badge. 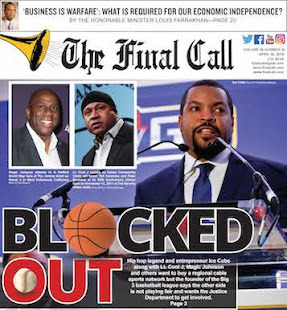 While the opposition celebrated the decision, supporters of Minister Farrakhan found it to be a frivolous attempt to derail his social media reach; boldly declaring that he is verified by God and verified in the hearts and minds of the people. Why is Minister Farrakhan’s account de-verified then? Many news outlets reported that Minister Farrakhan’s blue verification badge was ultimately removed due to a video posted to his account on June 6 with the caption, “Thoroughly and completely unmasking the Satanic Jew and the Synagogue of Satan.” The clip, only a minute and a half in length, is from the May 27 address he delivered at Mosque Maryam in Chicago. “I wonder will you recognize Satan. 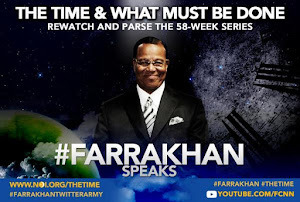 I wonder will you see the Satanic Jew and the Synagogue of Satan which has many races in it because Satan has deceived the whole world,” said Minister Farrakhan in the posted video, which has over 800,000 views. “Think about the message that I was blessed by God to give you today. Think about what they’re going to say when they have been so thoroughly and completely unmasked. Whenever you read that God has told the Jews to hear and obey and they say, ‘I hear and I disobey,’ that’s Satan openly disobeying God. He’s prepared to take the whole world down with him. Come out. Come out of her my people,” he continued. The Anti-Defamation League and others, such as CNN’s Jake Tapper, started attacking the entire message and that video clip in particular as being “hateful” and “anti-semitic.” Twitter, Inc. then started receiving numerous reports from those who flagged the video in hopes it would be removed for so-called violations of Twitter’s policies. Many such as former Daily Mail reporter Karen Yossman tweeted out that they reported the same video yet received the same response from Twitter. If Twitter and their executives found no violations of their policies or terms of services in that video, what’s the motive for de-verifying Minister Farrakhan? Who is behind this? 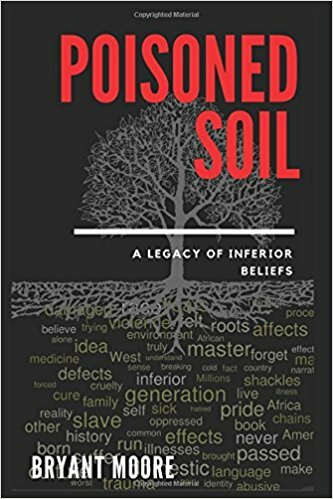 In his latest Youtube video titled “The Internet Slave Patrol Attack Free Speech,” Nation of Islam Research Team member Ilia Rashad discussed how the Anti-Defamation League and the Southern Poverty Law Center have heavily inserted themselves into Silicon Valley to advise Twitter, Facebook, Google and Amazon on the issue of “online hate;” which is really a tactic to take control of that which has freed the masses from the control of the elite. Minister Farrakhan’s presence on social media cannot be taken likely especially with so much opposition coming against his pages. His Twitter account has been active since March 2011 and his #AskFarrakhan Q/A’s became rapidly popular; often trending in the top ten topics. 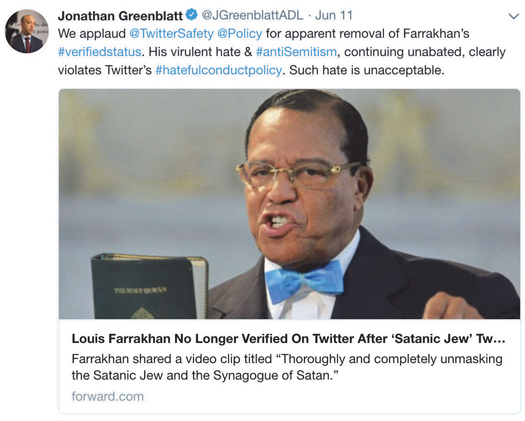 It wasn’t until 2013 that Twitter decided to verify his account, however, it was only due to multiple complaints sent to the company after Minister Farrakhan’s account strangely lost tens of thousands of followers in a matter of 24 hours. 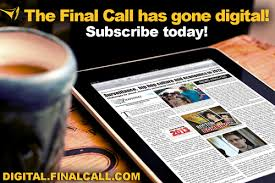 The company gave no reasoning for the loss in followers and since, Minister Farrakhan’s follower count has been stifled. His Facebook was blocked for over a week in mid-2016 due to the opposition repeatedly flagging a clip from the Justice Or Else! Tour that dealt with separation. His Instagram page has also been targeted with a few recent videos dealing with the Talmud removed without explanation. The Youtube.com link to his Saviours’ Day 2018 keynote address has been flagged as well. This is to be expected and none of it has slowed Minister Farrakhan’s impact, which is why he continues to be openly attacked and makes news headlines just from short tweeted statements or a video clip posted on his Facebook page to his over one million followers. 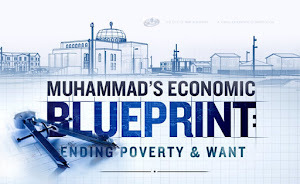 His pages—coupled with The Final Call and Nation of Islam’s Youtube channels—are consistently generating millions of views and uniquely touching lives. 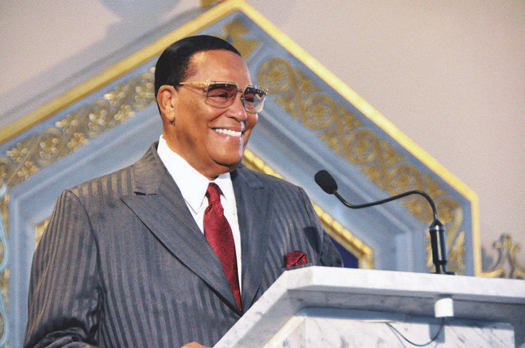 “The ban on Farrakhan is the greatest sign that he is feared, because of his message to the rulers of darkness. 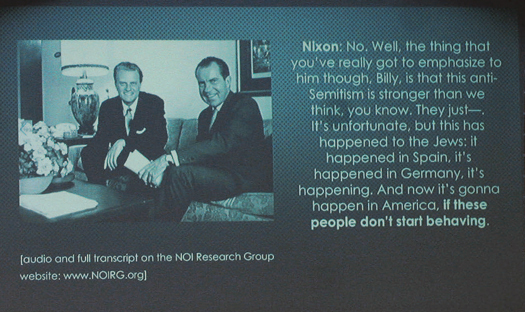 Yet; they cannot keep the people from searching for a method to hear his message. The Minister told me 35 years ago he would reach millions one day and never have to leave his home. This is that moment. Millions are inspired by his message,” posted Imam Abdul Malik on Facebook after a pre-recorded video from Minister Farrakhan was banned by the UK from being played at a rally last summer. “Sir, we see your videos on youtube, we follow your true religious teachings, we appreciate your doctrine that aims at empowering black people, the truth you are sharing with millions is slowly getting recognition, thank you,” tweeted Nkululeko Mfecane of Western Cape, Cape Town, South Africa. “I can’t begin to explain how much this man has taught me...through a computer screen...how to live, how to eat, how to treat a women, how to serve god, how to be the best I can be....I want to say thank you but thank you isn’t enough. I love you Minister ♥ thank you so much,” tweeted @realrightpmg. “I could never thank you enough sir, hearing your speeches and words of truth, saved my life and kept me from killing myself. i thank Allah for you. I’m forever grateful and will always base my life off the principles you taught,” expressed one of his Instagram followers in a private direct message. “Minister Farrakhan, you’re the realest. The more they attack you, the more I’ve been wanting to learn more about you and Elijah Muhammad and the NOI. I’m glad I have started studying y’all because at the age of 20 I now have someone I can pattern my life after. You’re saving lives and that’s why they are upset,” posted Ashley Johnson on Facebook.